A new school construction fund supported with money raised by the lottery helps small, rural communities build the schools their students deserve. Jones Senior High (JSH) students returning to school this week will see a new $46 million campus under construction next door that will soon house new, state-of-the-art classrooms for pre-k-5, middle school, and high school students. The new campus, scheduled to open a year from now, provides an example of how money raised by the lottery is going to work to help small, rural counties secure the money they need to build new schools. A grant of $15 million in lottery funds will cover about a third of the costs of the new campus. About 60 percent of students in the county will attend school there. 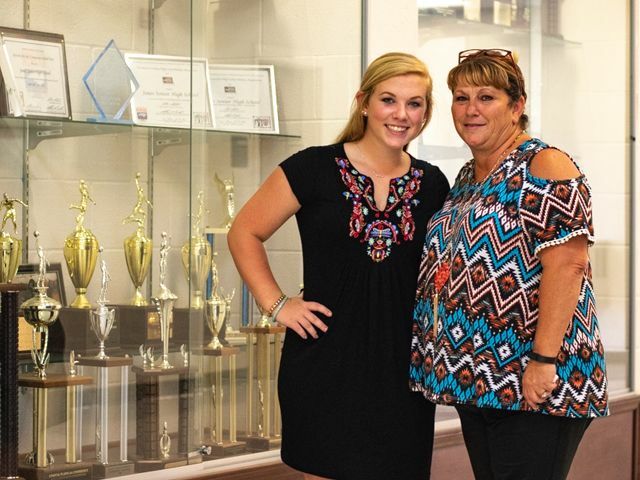 Joy Wynne, a graduate of JSH, and her daughter, a rising sophomore at JHS, are both excited and ready for the opportunities a new school will bring. This year, $217 million raised by the lottery will help build and repair schools all across the state. Whether you prefer the thrill of a scratch-off or the anticipation of a draw game, your fun makes a difference for our state’s future. If you have a child returning to school, or if you are returning to school yourself, we wish you the best of luck and welcome back! 9/02/2018 10:01 - charles m.
Hi Charles, Winners win prizes randomly in both draw games and scratch-off tickets regardless of who they are or where they live. The lottery is open to anyone who makes the choice to play. 9/02/2018 09:54 - charles m.
Yeah Google the population Of whites in Jones co. Oppose to blacks. 8/29/2018 04:54 - IDA R.
8/28/2018 01:07 - Chris J. Great photo op, but we need to write in a law, that uses only American made materials and American labor. S Carolina just complained that with the new tariffs on Chinese made steal would break their budget. American made steal should have been in the budget to began with.Every school I attended was built more than 70 years ago and some are still in use today.Schools built today will not last without millions of dollar upgrades every 10 to 20 years. Seems they all want to play the stadium game. Build it right to began with and it will save use all money in the long run. 8/28/2018 11:11 - George H.
Hey George, Jones County is located in eastern North Carolina, about an hour south of Greenville.